The MDP’s candidate for Thinadhoo North was accused of domestic violence. 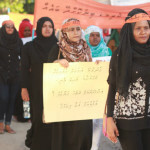 Supporters of the Maldivian Democratic Party on Thinadhoo island protested Monday afternoon after the ruling party withdrew support for the constituency’s parliamentary candidate. 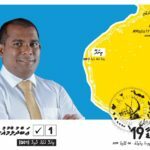 The MDP withdrew support for Thinadhoo North candidate Abdul Mughni citing “serious allegations” of domestic violence raised by his ex-wife on social media. But Mughni has refused to drop out and the party lacks the legal authority to withdraw his candidacy for the April 6 polls. Mughni has protested his innocence and criticised the MDP’s decision to take action without questioning him. “Any action must be taken after properly investigating the matter through the party’s internal bodies in accordance with rules and principles to ensure justice and fairness,” he said in a statement Monday night. Mughni stressed that he was never charged with a crime. The alleged incidents of abuse occurred 11 years ago. Mughni’s ex-wife raised the allegations after he sought the MDP’s ticket in November. He went on to win the primary election in January with over 60 percent of the vote. On Sunday, amid growing calls for the party to withdraw its support or declare a stand, her allegations were supported by people who witnessed the alleged abuse. One man claimed he had dragged Mughni away while he was beating his wife. At her daily press briefing on Tuesday, MDP campaign spokeswoman Afshan Latheef defended the withdrawal of support for Mughni as “a political decision” taken by the party’s leadership. 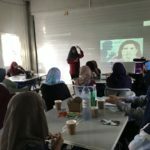 As the party’s charter gives the leadership the discretion and authority, the decision did not require consultation with the party’s organs or an inquiry by the disciplinary committee, she contended. On Monday night, the MDP’s Thinadhoo branch passed a resolution calling on the party to reconsider its decision. The resolution condemned the leadership for making the decision without consulting the Thinadhoo branch and questioned the credibility of the allegations. 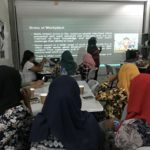 The MDP spokeswoman said Tuesday that Mughni’s statement and the Thinadhoo branch’s resolution are under consideration. On Monday, Latheef had told the press that the party’s leadership figures would not join any of Mughni’s campaign activities. 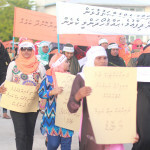 Hours after the spokeswoman’s announcement, Mughni’s supporters marched on the southern island with banners declaring support for the candidate. “This is not Mahibadhoo, this is Thinadhoo. You can’t mess with us, this is rebellious Thinadhoo,” read one banner, referring to the MDP’s decision to support coalition partner Adhaalath Party’s candidate in the Mahibadhoo constituency and the forced depopulation of Thinadhoo in 1962. 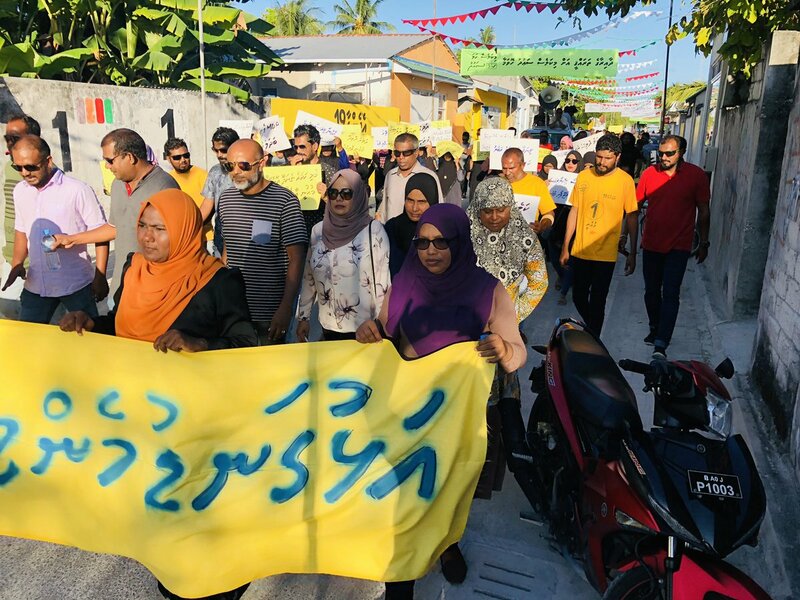 “The people of Thinadhoo have always said that we will not give the chance to stray from the road of justice,” a protester said. 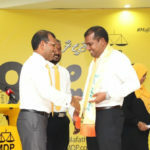 The MDP leadership wants to “gift the seat” to incumbent Thinadhoo North MP Saudhulla Hilmy, who is contesting with the support of former president Maumoon Abdul Gayoom, some Mughni supporters alleged. On Monday, Gayoom applauded the MDP’s decision. But Saudhulla Hilmy denied allegations of a secret deal between the MDP and Gayoom’s Maldives Reform Movement. “MRM and MDP are in a coalition. We were in a coalition when MDP held a primary and all these [domestic violence] accusations started. MDP will definitely not want to give up a seat. They believe they have a huge support on that island. So why would they give up a seat if they know they can win?” he asked during an appearance on VTV. The MDP spokeswoman said the party has not made a decision on supporting another candidate. It’s always hard for political parties to take unpopular stands for the sake of protecting the vulnerable and upholding values that are not shared by the majority. This is why the justice system exists. This is why that system should function better. Allegations were there from the onset. @aishathrizna had brought it to attention during the primary itself. If the party had taken action back then perhaps constituents of TU wouldn’t be in this mess right now.